A commemorative marker stands, Tuesday, Nov. 27, 2018, at Central Burying Ground on Boston Common at the gravesite of Bartholomew Trow, a participant in the Dec. 16, 1773 protest known as the Boston Tea Party. This year is the 245th anniversary of the protest, during which colonists protesting taxation without representation threw British tea into Boston Harbor in what is considered a pivotal event that led to the American Revolution. 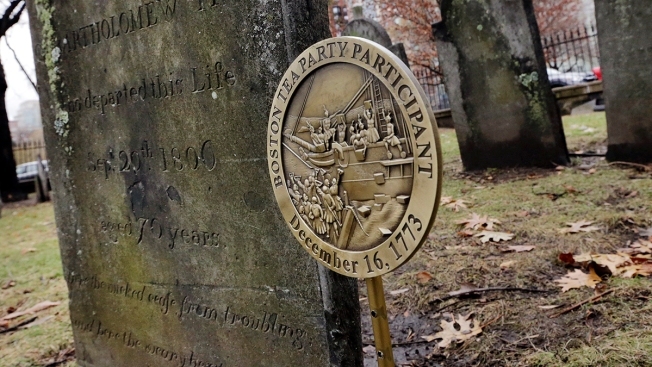 The Boston Tea Party Ships and Museum and the city of Boston have joined forces to place commemorative markers at the graves of those who participated in the Dec. 16, 1773 protest. The markers were placed Tuesday at about 70 sites in four Boston cemeteries, including the Central Burying Ground; Copp's Hill Burying Ground; the Granary Burying Ground; and King's Chapel Burying Ground. The markers will remain on display until the end of the year. The image on the markers was inspired by Nathaniel Currier's "The Destruction of the Tea at Boston Harbor" 1846 lithograph. This year is the 245th anniversary of the protest during which colonists protesting taxation without representation threw British tea into Boston Harbor. It is considered a pivotal event that led to the American Revolution.